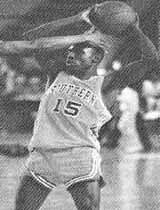 Southern University was the 13th seed in the West Region which meant they would be offered up to the no.4 seeded Georgia Tech Bulldogs in the first round of the 1993 NCAA Tournament. 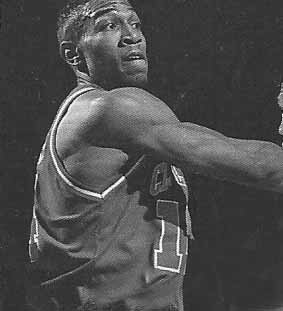 Ben Jobe had the Jaguars playing at a high level, averaging 97.9 points per game, and Georgia Tech was having one of those years when they were dominating their rivals, Duke University, North Carolina and the rest of the powerful Atlantic Coast Conference. The Jaguars showed early jitters as they fell behind by 15 and trailed 32-17 with eight minutes remaining before halftime. Then 6-6 All-America forward Jervaughn Scales and 6-7 Leonard White played volleyball against the backboards as they battled Tech’s All-Americans Malcolm Mackey and James Forrest. With the game tied at 61, 6-2 point guard Terry Thomas (20 points) led Southern on a 15-2 run and Tech never recovered. Scales had a monster performance with 27 points, 18 rebounds, 3 blocked shots and three steals. The Jaguars dropped their second round game, 90-80 to George Washington Colonials, led by their high-scoring freshman guard Kwame Evans. 1993: Southern averaged 97.9 points…Hi: 157 points vs. Prairie View A&M…156 vs. Baptist Christian. They started the season with non-conference blowout losses to Division I power-house Oklahoma (88-64) and Nebraska (88-72) and ended as the top seed in the Mid-Eastern Athletic Conference tournament. The Coppin State Eagles earned an automatic berth in the NCAA Regionals after a 81-74 win over no.3 seed North Carolina A&T in the MEAC finals. They were the no. 15 seed (30-point underdogs) going up against no.2 seed South Carolina in the first round of the NCAA playoffs. Despite their big advantage, South Carolina only led by seven (47-40) with 13 minutes left before collapsing and becoming just the third no. 2 seed to lose a first-round game. The Eagles took a 55-54 lead with less than seven minutes to go and put the Gamecocks away when a three point shot as the shot clock expired. It gave the Eagles a 9-point lead with less than two minutes left in the game… Junior guard Antoine Brockington, senior center Terquin Mott and senior guard Reggie Welch had held the Gamecocks high-scoring guard trio – Larry Davis, P.J. Mckie and Melvin Watson to a combined 31 points. Eagles reserved guard Danny Singletary scored all but four of his game-high 22 points in the second half and led the team to an unbelievable 13-point upset of the no. 2 seed, which was touted by some to win it all. Coppin State almost pulled off another upset, narrowly lost to Texas in the second round, 52-51. It was the standard matchup – #15 vs. #2 Iowa State in then 2001 NCAA first Round Regional Playoffs. 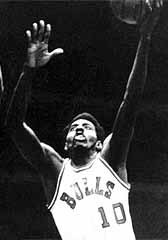 The Hampton Pirates, first time out of the Mid-Eastern Athletic Conference, was facing All-Americans and future NBA first round draft picks Marcus Fizer and Jamal Tinsley. Under head coach Steve Merfeld, the Pirates breezed through the MEAC tournament with victories over Morgan State, 76-64; Norfolk State, 94-67 and 70-53 over South Carolina State in the finals. Senior forward Tarvis Williams was named Regional Most Valuable Player. Iowa State, led by point guard Tinsley, had come within one game of the Final Four the previous season. Hampton was making it’s first appearance in the NCAA March Madness. The Pirates started off a little shaky but only trailed by 11 points in the second half when they began to close the gap behind forward Williams and David Johnson, who put back a missed layup that tied the game. It was a heart stopping climax as Williams knocked down a short jumper that gave Hampton a 58-57 win as time was winding down. The Cyclones had one last gasp, but Tinsley missed a layup with 1.2 seconds and that set off a wild celebration for the Pirates faithful. It was the third time a historically black college pulled a major upset in the opening round of the NCAA Basketball Tournament (the other were Coppin State over South Carolina in 1997 and Hampton over Iowa State in 2001). In their first ever NCAA tournament appearance, the Norfolk State Spartans made it count by defeating no. 1 seed Missouri, 86-84. All-MEAC forward Kyle O’Quinn led all scorers with 26 points and grabbed 14 rebounds. He scored the decisive basket on an old fashioned three-point play with 34.9 seconds left and the score tied 81 all. Missouri was a 21-point favorite, but had to battle back all game long. The Spartans took advantage of Mizzou’s lax defense to find open spots on the floor and get easy looks at the basket and shot an identical 53 per cent from the field and three –point range. The Tigers shot also shot 52 per cent from the floor but every time Mizzou’s head coach Frank Haith’s team took a lead, it could not stop the Pirates on the defensive end of the floor. Norfolk State hung around with easy baskets underneath, then surged to a late lead because of poor perimeter defense. After O’Quinn put the Spartans ahead by four points after two successful free throws, the Tigers clawed back behind guard Phil Pressy (20 points) and his long three pointer cut the Spartans lead to 85-84. Norfolk State’s Rodney McCauley missed the second of two free throws with eight seconds remaining, but O’Quinn forced a crucial jump ball with the arrow favoring the Spartans. After O’Quinn put the Spartans ahead by four points after two successful free throws, the Tigers clawed back behind guard Phil Pressy (20 points) and his long three pointer cut the Spartans lead to 85-84. Norfolk State’s Rodney McCauley missed the second of two free throws with eight seconds remaining, but O’Quinn forced a crucial jump ball with the arrow favoring the Spartans. He missed two ensuing free throws that would have sealed the victory, but with 2.0 seconds remaining, Pressy’s desperation three-pointer clanged off the back rim and doomed the Tigers comeback.